Over the weekend my wife Marilyn and I headed to a birthday party in the coastal town of Inverness. After a beautiful drive through the Sonoma countryside, we met with company on the patio of Priscilla’s Cafe. After greetings and birthday wishes, lunch began with a round of raw oysters, pints of ale and fresh squeezed lemonade. Afterward, I dove into fish tacos made with fresh local snapper and stacked high with avocado, salsa fresca and crunchy lettuce. What a treat. After lunch, we drove out to the Point Reyes Lighthouse on the tip of the nearby peninsula.Â On a previous drive some years ago, Marilyn and I had almost made it to the lighthouse at sunset, only to end up turning back to make our dinner reservations. This time we were determined to see the lighthouse. After a forty-five minute drive and one wrong turn, we arrived at the gate. From here, a foot path led to the visitor’s center located a half mile away. Stoically, we decided to hoof it. Unlike the sunny skies of Inverness, here a cold wind blew thick fog that dampened my glasses, limiting vision to about 20 feet. I wondered if we would see the lighthouse or just bump into it.Â The wind whistled through twisted, windblown cypress trees lining the path. At the visitor’s center we learned to get to the lighthouse itself, we had to descend a 308 step staircase, and that closing time was 10 minutes away. Racing down the first 200 steps, we finally saw the lighthouse come into view. Marilyn stopped, saying she’d rather wait for another time to go on, another day when we’d have time to explore. I felt disappointed, but had to agree. This turn of events gives us a great excuse to continue the adventure soon. With only a few minutes to spare, I decided to do a quick sketch from my place on the stairs. 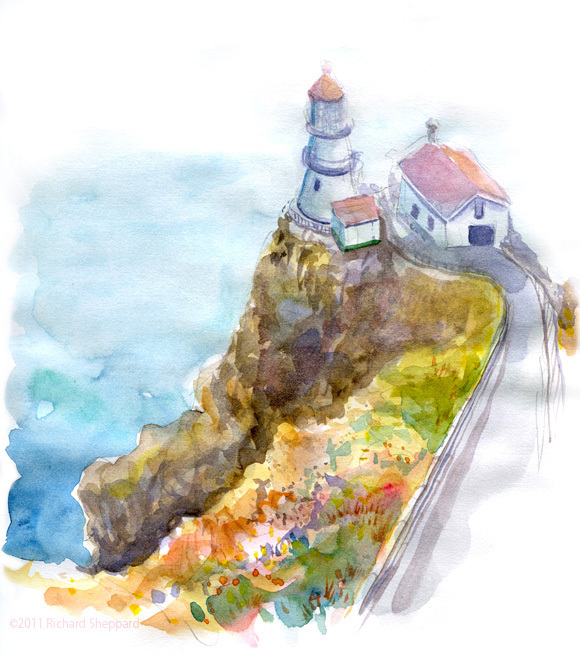 Since the lighthouse was partially covered in fog, I chose not to use pen and ink, reasoning that the softness of watercolor would better represent this moody weather. Running out of time, I walked back up the stairs and found Marilyn at the visitor’s center looking at guidebooks. Together, we headed home where I put the finishing touches on the painting. September 3, 2011 March 29, 2013 Richard SheppardComments are off for this post. This is stunning, Richard! I’m amazed at how you captured fog with the watercolors. It is beautifully tangible. And I continue to admire all the different hues you work into single planes of your paintings. Your technique gives such richness and depth. is similar to my blog but its the community and comments section below that make it so worth while. check it out! I can’t imagine being able to sketch after racing 2/3 of the way down that staircase! Gorgeous. I’m a huge fan of fog! AND I don’t have the foggiest idea how an artist would capture it. Thanks Jean! I was huffing and puffing while sketching. I wish I had the time to finish it there but I finished it up at home from a photo. Don’t like to do that but I prefer to have it finished. Fog is fun to paint. Limiting detail, muting colors, and lighter value washes are all ways to help simulate fog. Try it some time, it’s fun!